Altar Servers not only assist the Priest during Mass, they are required to have a full understanding of the Mass traditions through training sessions and practice. Altar Servers have a courteous and reverent attitude. The St. Pius X Altar Server Training Camp is available during the summers for any Parishioner (Third Grade or older) who has received his or her First Holy Eucharist. If you or someone you know would like to learn more about becoming a St. Pius X Altar Server, contact Mary Wirth in the Parish Office at: 920-733-0575 or email: volunteer@stpiusxappleton.com. Eucharistic Ministers are parishioners who are trained and entrusted in offering the Body and Blood of Christ to their fellow parishioners and have a reverence for the Sacrament they distribute to the community. Becoming a Eucharistic Minister is a great way to become involved in the Mass. Many Catholics do not realize who is qualified to become a Eucharistic Minister. 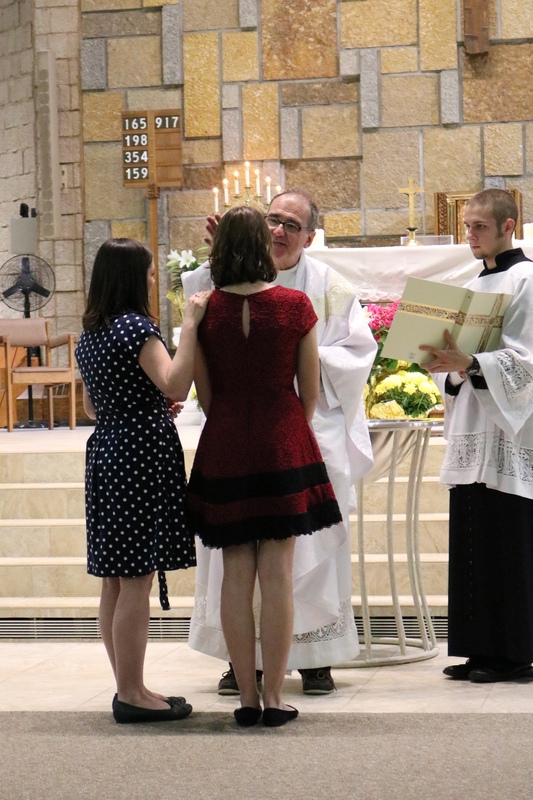 Following are the requirements: You need to be a confirmed Catholic who is mature in your Faith, and, if you are married, your marriage had to have been blessed by the Church. If you would like to find out how to become a trained, Eucharistic Minister, contact Mary Wirth at the Parish Office at: 920-733-0575 or email: volunteer@stpiusxappleton.com. The Lectors of St. Pius X are entrusted and trained with delivering the Word of God to those who are gathered together in praise. Lectors should be strong in their Faith, attend weekly Mass, enjoy being in front of crowds and need to feel comfortable with public speaking. If you are interested in learning how to become a Lector at St. Pius X, please contact Mary Wirth in the Parish Office at: 920-733-0575 or email: volunteer@stpiusxappleton.com. Sacristans are those Parishioners who are behind the scenes setting up before Mass and cleaning up after Mass. Becoming a Sacristan requires some training and is ideal for those who wish to serve, but do not like to be in front of crowds. For more information about becoming a Sacristan, contact Mary Wirth in the Parish Office at: 920-733-0575 or email: volunteer@stpiusxappleton.com. Greeters: Welcoming those who are coming to worship with us at the doors of the Church. Handing out Mass guidebooks and directing people to the restrooms, coat racks, and to the Chapel. Ushers: Serving and assisting guests inside the worship space. Directing the flow of traffic during communion, handing out bulletins, taking up the collection, and assist people in finding seats. If you are interested in serving as a Greeter or as an Usher, contact Terry Kuehl in the Parish Office at 920-733-0575 or email: administrator@stpiusxappleton.com. The St. Pius X Art & Environment team create decorative themes for the Church. Members meet as needed to plan and complete the decorating of the worship space. Resources and workshops are available. If you are interested in joining the Art & Environment Team, contact Mary Wirth in the Parish Office at 920-733-0575 or email: volunteer@stpiusxappleton.com.